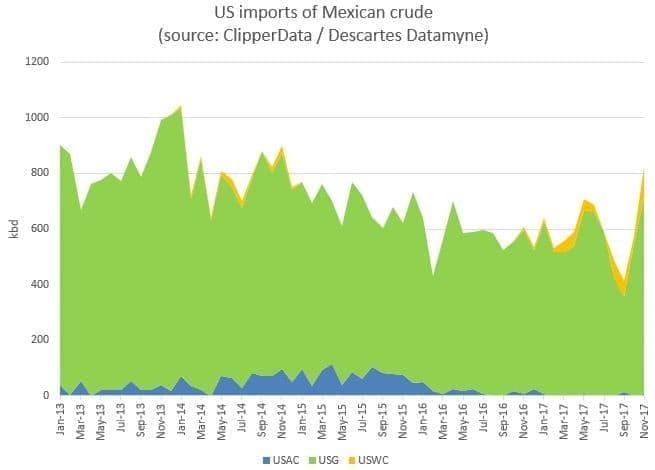 Mexican crude imports in September dropped to the lowest month on our records (since at least 2012), as Hurricane Harvey caused refineries along the U.S. Gulf Coast to temporarily shut down, reducing oil demand. In response to hurricane activity in the Gulf of Mexico, several vessels that were loaded on the east coast of Mexico have headed south instead, around Cape Horn and to the U.S. West Coast - a rare journey indeed. Accordingly, Mexican crude imports to the U.S. West Coast have climbed to the highest on our records in November at 111,000 bpd. This increase in Mexican crude to the U.S. has coincided with a rise in total crude exports from the country. Export loadings reached a fourteen-month high in November, climbing above 1.3 million barrels per day for the first time this year. 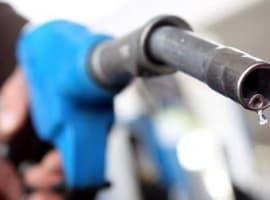 The rise in exports is instead related to greater volumes being available for export after a series of refinery outages in the country. 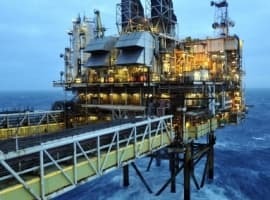 One such example is Mexico's largest refinery, Salina Cruz; it has been taken offline for sustained periods this year after both storm and earthquake damage. 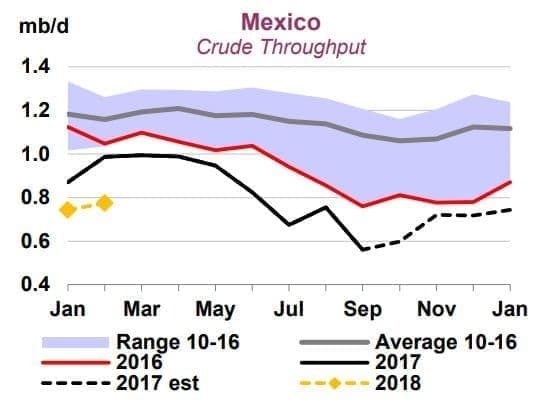 As the chart from the IEA below illustrates, crude throughput remains adrift of the five-year range to the downside amid depressed refinery activity. 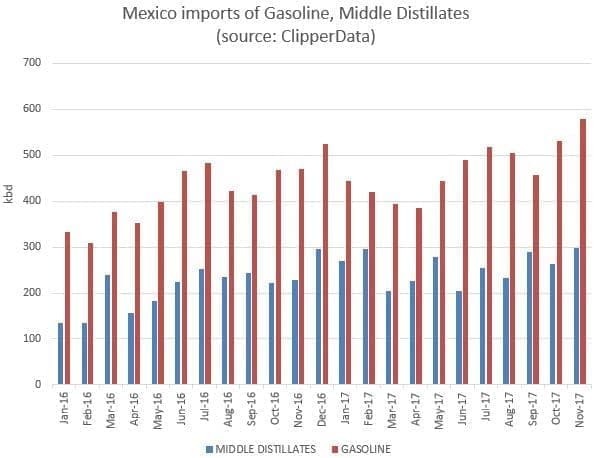 While outages have been particularly pronounced this year, a persistent lack of investment by state-run oil company Pemex over the years has meant refineries are in a similar situation to Mexican domestic oil production - in structural decline. The U.S. is the source for 90 percent of middle distillate deliveries, and just over 80 percent of gasoline receipts. Mexico's production of total petroleum liquids fell from 3.8 million bpd in 2004 to 2.5 million bpd in 2016. Their total liquids consumption fell slightly, from 2.0 million bpd in 2004 to 1.9 million bpd in 2016. The 12 year rate of decline in production was 3.5%/year, but net exports fell at 9.6%/year, from 2004 to 2016. Note that Pemex reported 2017 production of only 2.25 million bpd through October. Assuming that their production averages 2.2 million bpd in 2017, their net exports in 2017 would be down to only 0.3 million bpd (assuming no change in consumption), which would be a rate of decline in net exports of 14%/year since 2004 and a simple percentage year over year decline of 50% (exponential year over year decline rate of 70%/year), AKA an accelerating rate of decline in net exports. Based on the 2004 to 2016 rate of decline in Mexico's ECI Ratio, I estimate that Mexico's post-2004 Cumulative Net Exports (CNE, total petroleum liquids), will be on the order of about 7 Gb. They shipped 4.6 GB from 2005 to 2016 inclusive, which would put their estimated post-2004 CNE at about 70% depleted at the end of 2016. However, if their production averages 2.2 million bpd for 2017, against consumption of 1.9 million bpd, it would imply estimated post-2004 CNE of only about 5 Gb, which would put their post-2004 CNE at about 90% depleted at the end 2016. 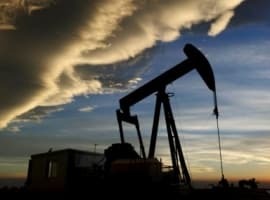 The foregoing is consistent with what a simple mathematical model predicts, and it is consistent with previous real world case histories, to-wit, given an ongoing, and inevitable decline in production in a net oil exporting country, unless they cut their domestic liquids consumption at the same rate as, or at a faster rate than, the rate of decline in production, it's a mathematical certainty that the rate of decline in net exports will exceed the rate of decline in production and that the rate of decline in net exports will accelerate with time, e.g., Mexico. 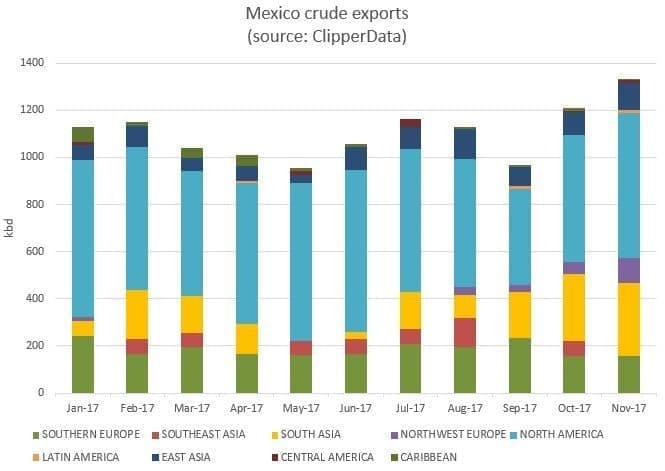 Mexico's net exports fell from 1.8 million bpd in 2004 to 0.6 million bpd in 2016, and will probably be down to about 0.3 million bpd in 2017, as they quickly approach zero net oil exports.